Brandon Beachy seemingly emerged out of thin air last year to make 25 great starts for the Atlanta Braves. His rookie campaign was injury shortened as he missed most of May and June limiting him to 142 innings, but his numbers were quite impressive. While his 3.68 ERA was fourth (of five) among rookie hurlers with 100+ innings in the National League, his 10.7 K/9 led all MLB pitchers who threw 140+ innings. His 1.21 WHIP was quite good, too. In fact, everything about his stat profile said his ERA should’ve been better, evidenced further by his 3.16 xFIP. His 1.0 HR/9 hurt with seven of 16 longshots including additional runners on base. After all of that, many looked forward to the encore presentation of Beachy. So far it has been nothing short of amazing. He leads baseball with a 1.87 ERA and trails just a few guys for lead in WHIP with his 0.95 in 72 innings. He has cut the flyball and line drive rates channeling it into a 9% increase in groundball rate (42%) resulting in a near-halving of his home run rate to 0.6 HR/9. He has some good fortune and sparkling defensive support yielding a miniscule and league-best .207 BABIP. Despite all that he is just 5-4 which is exhibit 5,938,291,764 of why win-loss record is virtually useless as a standalone judge for how a pitcher has fared. So tired are his defenders from flashing the leather that they’ve given him just 6.4 runs per game, 50th-best among qualified starters in baseball. While there is so much good going on in Beachy’s season, it is hard not to notice the 3.6 strikeouts he has shaved off of his rate down to 7.1 K/9. He has actually cut his strikeout rate by more Henderson Alvarez (2.6), Derek Lowe (2.7) and Kevin Correia (3.1) have this season. By maintaining his walk rate and matching last year’s 2.9 BB/9, he still has a solid if unspectacular 2.5 K/BB (61st among qualified starters). But why the stark drop in punch outs? He reached the majors in 2010 after spending most his season in the AA bullpen followed by seven strong starts AAA where he posted a 9.5 K/9 and 8.0 K/BB in 46 innings. In three late-season starts for the big league club he was solid, especially for a 23-year old rookie. He had a 3.00 ERA, 1.53 WHIP, 9.0 K/9 and 2.1 K/BB in his 15 innings. His 2011 breakout was spurred by the development of a slider, a pitch he didn’t even throw in his three late-season starts in 2010. He had a strikeout per inning during those three 2010 starts though none of his three pitches (fastball, changeup, curveball) was his specific strikeout pitch. The slider became his most-used secondary pitch at 19% easily outpacing the changeup (11%) and curveball (10%). It turned the strikeout rate we saw in his 2010 season, both in the majors and minors, into something real. Not only did batters put together a measly .182/.223/.339 line in plate appearances that ended on sliders, but they struck 40% of the time on it. He generated 52 of his 169 strikeouts (31%) on the pitch burying it low and away to righties, down and in on lefties. Righties flailed at it while lefties swung over the top of it. The fastball (28%), changeup (22%) and curveball (17%) contributed plenty to the bottom line which isn’t surprising as you aren’t going to carry a 10.7 K/9 with one pitch for strikeouts (unless you’re a reliever). The slider was his secondary pitch of choice when it counted, though. He threw his fastball 52% of the time in 2-strike counts and his slider 29% of the time while the change and curve were at 9% and 10%, respectively. His pitch usage in 2-strike counts this year isn’t really any different with the slider being used a little less at 25%, the fastball up to 55% and the change (8%) and curveball (12%) almost exactly the same. So he hasn’t changed his approach for garnering strikeouts, but the pitch selection just hasn’t been as effective (obviously). Batters are laying off the fastball and slider much more with precipitous declines in the swing-through rates on both with two strikes. Both are being put into play more often, though obviously with good results based on his great results and tiny BABIP. Only 6% of the fastballs in play last year were groundballs, this year it is up to 11% while the slider has risen from 10% to 12%. Again, that is in 2-strike counts. 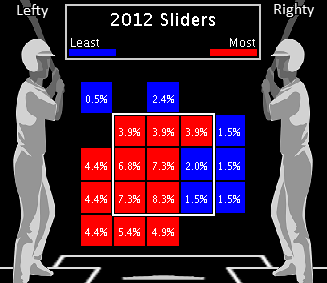 Perhaps the more patient approach from hitters is causing Beachy to find the zone more often with the slider. So far it hasn’t hurt him at all, but in general allowing more balls in play is obviously more dangerous than fanning a guy. The 5% increase in ball rate on 2-strike counts from the slider cannot be ignored, either. Those could just be waste pitches as he tries to get batters to chase as they did often last year, but it looks like batters are laying off of the bad ones and waiting for something more hittable. Hittable absolutely being a relative phrase because as while they aren’t striking out on the pitch, they certainly aren’t doing anything worthwhile with the slider. Opponents have a .172/.180/.207 (yes, .387 OPS!) against the pitch overall. Beachy has clearly traded those strikeouts in for tons of weak contact which can be an effective path toward success, too. Yes it is unlikely that he can sustain a .207 BABIP over the season, but he doesn’t need to end the year with a 1.87 ERA/0.95 WHIP to be successful. How has the lower strikeout rate impacted his ability to go deeper into games? One issue with Beachy in his rookie season was his sub-6.0 innings per start rate. He only found the seventh inning three times in his 25 starts and the eighth inning just once. He was awesome at six inning outings, though. He had 13 of them and gave up more than three runs just three times. He has raised his average innings per start from five and two-thirds to just about six and two-thirds. Over the course of a 32-start season, that’s a 29-inning increase and he is currently pacing toward a 211 inning season. With 34% of his season banked at such an incredible ERA, he has a lot of wiggle room. While it is reasonable to expect some regression, it would be surprising if the bottom randomly fell out for Beachy. There were 16 pitchers with a sub-3.00 ERA last year including the likes of Ryan Vogelsong and Jeremy Hellickson, both of whom didn’t have the skills that Beachy previously displayed and is currently displaying. But even if we are conservative and just give Beachy a 3.00 on the dot, he still has 138.7 innings of 3.57 ERA. You don’t have to sell high to avoid apocalypse. You can, especially if the returns significantly help your team, but Beachy has been great this year and he is still fooling hitters even with the diminished strikeout rate. Is it possible that he is pitching more to contact with the slider, it’s a tough pitch to handle even if you know it’s coming, as long as it is not hung out over the middle. Definitely and it’s working really well right now, but allowing more contact on purpose, even if it should usually be weak contact, is dangerous. Of course he’d be better off getting strikeouts both from his own standpoint and of course from a fantasy standpoint. Oddly enough the new approach hasn’t saved him any pitches per plate appearance as he is at 4.1 in 2011 and 2012. Meanwhile I was surprised to see that he hasn’t even saved a full pitch per inning despite the strikeout decline as he is at 16.1 P/IP this year after a 17.0 rate last year.